The secret is small, incremental changes! See the thing is, I'm always setting new goals and challenges for myself. From financial to wellness to personal relationship goals, I'm always striving to be a better person when I go to sleep at night than I was when I woke up that morning. Some days that doesn't happen, but usually it does. I don't lament on my failures, but instead resolve to myself that I'll be a better person from it. I'm not the first person to learn this, and I certainly won't be the last. Being a geoscientist, putting this mindset into mathematical terms further helped me to appreciate the long term growth I can achieve by making sure I'm 1% better everyday. Compound growth can be hard to wrap your mind around, so below is a graph demonstrating exactly how powerful adopting a daily 1% better mindset and action plan can be in regards to achieving your personal goals. 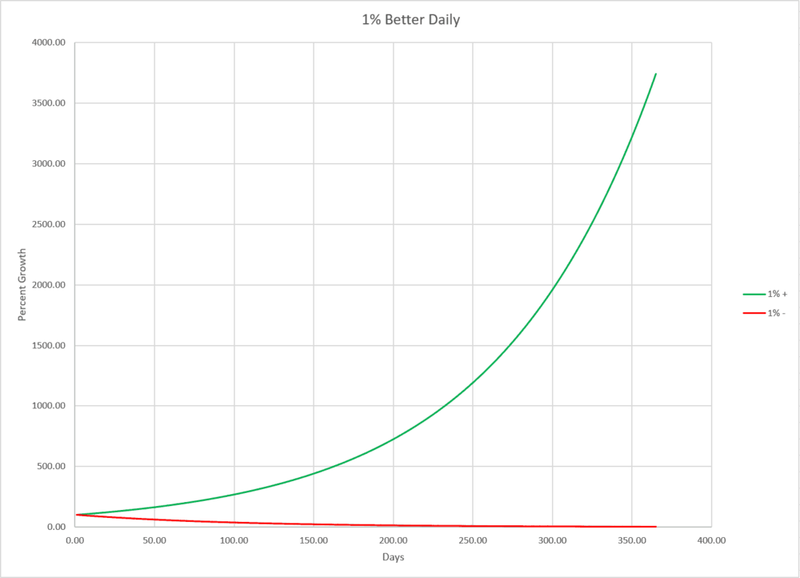 The starting conditions of this mathematical model are 100 for both the green and red trendlines, but the green line was modeled to experience daily +1% compound growth over 365 days, while the red line was modeled to experience daily -1% compound growth over 365 days. I believe that ANYBODY can be 1% better everyday, as long as they put their minds to it. So give it a shot and join me! Let's check in this time next year and see how we did. Best of luck!